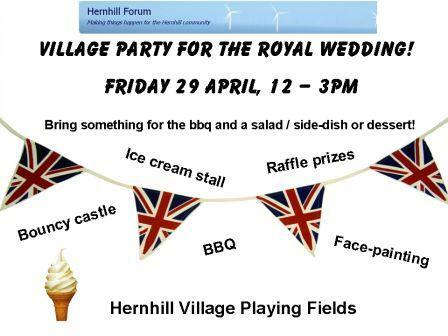 Friday 29 April with a party on the village playing fields from 12-3pm! Featuring a bbq, ice-cream stall, face-painting and bouncy castle, it’s going to be a fun-filled afternoon: admission is free, you simply need to bring something for the bbq and a side-dish or dessert, plus whatever you want to drink. There’ll be a raffle as well: please contact Miriam or Dan via the hernhillforum if you would like to donate a prize, all gratefully received! Open to members of the local village and school community, families and friends: join the party! Fingers crossed for some fine weather: get the date in your diaries now, we’ll see you there!